Budock Cottage is situated in a peaceful location a short drive from South Cornwall's beautiful beaches and the sea faring town of Falmouth. The property is located on a small development of converted barns with a shared outdoor heated pool and large gardens. Up to 2 dogs are welcome at no additional charge. Tresooth Cottages are a select development of beautiful barn conversions and purpose built properties and are arranged neatly around a pretty courtyard which offer guests free and unlimited access to an excellent range of leisure facilities including a communal heated swimming pool, jacuzzi and sauna. Budock is situated in the main courtyard and is all on one level. Upon entrance there is an L shaped large living/ dining area with exposed wooden beam ceilings. The separate kitchen has a servery and slate tile floor. The hall leads to a master en-suite bedroom, one bunk room and one twin bedroom. It has one main bathroom with bath and shower over. Outside there is a picnic table to sit and relax. Parking is shared with the other barns and located to the front of the complex. This high end barn conversion is finished to an excellent standard and includes all of what you would expect from a modern home. The cottages are set around an enclosed courtyard that features its very own working water well. The barns are found tucked away in a peaceful centrally positioned location in a spacious area of natural beauty. Each cottage has a fully equipped farmhouse style kitchen with built in appliances including a microwave, dishwasher, washing machine, fridge and freezer. The living areas have flat screen TV, free-view and DVD players. Tresooth’s outstanding outdoor facilities include a large heated outdoor swimming pool with sun loungers (open 1st April - 30th September), jacuzzi, sauna, seating area, indoor games room (please note that some games are chargeable), a children’s play area with swings, trampoline, slide and an enclosed pond with fish. Games room - please note that some games are chargeable. Electricity, heating, bed linen & towels are all included but you will need to provide your own beach towels. There is parking available for a number of cars on the property. Up to 2 well behaved dogs are permitted at no additional cost although please remember that you cannot leave dogs unattended in the cottage alone. Regrettably no smoking is allowed. There is an iron and ironing board. A cot and high chair are available upon request. £100 security deposit pre-authorised on your card is required. Discounts available for couples staying for 7 nights booking outside the peak season, using one room only. Budock Cottage is situated just one mile from the quaint Cornish village Mawnan Smith, and three miles from the bustling port of Falmouth. Here you will find a host of shops, bars and restaurants, the award winning National Maritime Museum and Trebah Gardens which is not to be missed. Falmouth is one of Cornwall's most popular places to visit because of its unique mix of attractions, water sports, beaches, history and place to eat. The National Maritime Museum Cornwall and Pendennis Castle are both high on visitors lists of places to visit and the views from Pendennis on a fine day a truly magical. Falmouth is the sailing capital of Cornwall with its spectacular deep water natural harbour offering a haven for both cruisers and racers. Many events are held through the summer culminating in the famous Falmouth Regatta Week and associated shore side events. The beaches at Gyllingvase & Swanpool are coarse sand and are wonderfully sunny south facing spots. You can ride the ferry to beautiful St Mawes for the day or take a delightful trip around the estuary stopping off at either Trelissick Gardens or Smugglers Cottage for a cream tea! There are plenty of places to eat & drink in Falmouth and recently Rick Stein has opened his Fish & Chip Restaurant & Oyster Bar at Discovery Quay adding to the superb mix across the town. Guest from Hereford stayed for 7 nights. Dear Mr Price, Thanks for taking the time to review Budock cottage. We are pleased you had an enjoyable say and will hopefully welcome you back again one day. Guest from Neston stayed for 7 nights. Guest from Hampton stayed for 7 nights. 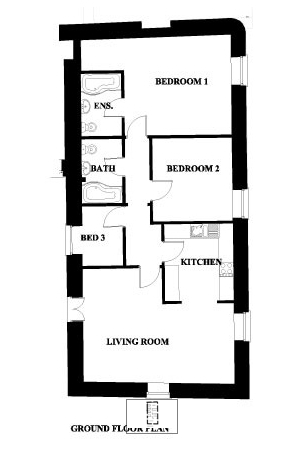 3 good size bedrooms, good living room and kitchen. Very hassle free stay. Only negative is lack of wifi in the cottage, particularly given there is limited mobile reception also. Guest from Wakefield stayed for 4 nights. Thank you for your comments, in regards to the wifi problem, there was a large storm in the area which has affected our connection. We are awaiting on an appointment from the scheduled engineers to take a look. As advertised the wifi is only in the games room and it is noted as being intermittent due to our rural location, so unfortunately you wouldn't have been able to use the NOW TV box in the cottage. Our advert with Cornwall's Cottages states clearly that "Tresooth Cottages are a select development of beautiful barn conversions and purpose built properties and are arranged neatly around a pretty courtyard which offer guests free and unlimited access to an excellent range of leisure facilities including Wi-FI, a communal heated swimming pool, Jacuzzi and Sauna." Which refers to the site as a whole. For health and safety reasons we don't provide salt and pepper and these are emptied after each guest, this is standard practice across all agencies we list with. Guest from Hartlepool stayed for 7 nights. Couldn't fault Budock Cottage. Very spacious and well equipped. My two teenagers loved going to the pool every day and the games room. The cottage was in a good location to go and visit other places. Will definitely be return to Cornwall next year. Guest from Exminster stayed for 7 nights. Budock Cottage was spacious, clean and the kitchen was well appointed. There were 5 in our party, and all the rooms were of a good size, so we didn't feel on top of each other. I was worried on arrival that the cottage backed onto the parking area, but due to the thick cottage walls, I was only disturbed occasionally by people coming and going. The thick walls also provided insulation from the heat of a good summer's week, and having small windows meant the rooms were cool and shady. The manager was on site, he welcomed us on the first day, and when our washing machine got blocked, he was there straight away to fix the problem. The onsite facilities were lovely,however, the pool (and spa area) is under trees, and so does have leaves and tree debris in it, but on the first day there we had the pool to ourselves and it was beautiful and clean. The gardens were a picture and in the heat it felt like we had gone to Spain instead of Cornwall. The only niggles would be the small drying rack provided - 5 wetsuits and beach towels plus swimwear need a more substantial rack to spread out on, (plus the washing lines are under trees), and it's a shame there is no shop or pub in walking distance of the cottage. Other than that, I can thoroughly recommend staying here. Thanks for taking the time to review Budock cottage. We are pleased you had an enjoyable stay and look forward to welcoming you back again one day. Guest from Boston stayed for 7 nights. Very relaxing and comfortable stay, a lovely complex. I couldn't get our washing machine to spin which was a bit of a nuisance but otherwise everything was just fine. I couldn't find the BBQ area, I am sure if I had asked someone would have shown me. The dryer room could be cleaner and tidier, I wouldn't have had to use it if the washer did a spin cycle. Obviously a car is required but the location is fine , I just wished that there was a sandy beach close by. On first sight, a well-appointed comfortable cottage with 2 showers and toilets, nice kitchen with all the usual kit. I had a bicycle with me, but despite the information booklet indicating that elsewhere on the site there was secure storage, this proved not to be the case, so my bike stayed in the living room. The heating system provided lots of heat, but it was either "on" or "off"; the thermostat and the timer didn't work. There is NO Wi-Fi despite the website and the booklet in the cottage indicating its existence. The toilet seat in one shower room was loose. The next day we discovered that the door lock (simple Yale) didn't work. Despite this being a Sunday, I had excellent service from the Cornwall Cottage management company, who located the on-site handyman. He seemed to fix the lock, but on closer inspection the only way to mend this was to replace the lock completely. I hope that this has been done now. The area around was very pretty. The local reservoir has a well-made track for walking or cycling. Recommended restaurants include Rick Stein's Fish/chip shop in Falmouth, and even better Guisseppe's 2 miles away in Mawnan Smith, which also has an excellent coffee shop with Wi-Fi. Lots of scenic villages and beautiful gardens to visit. In summary, a pleasant place but could be so much better with a few simple tweaks. Guest from Callander stayed for 7 nights. Lovely cottage, clean and very comfortable. Pool was fantastic as was hot tub. The maintenance team were very helpful and quick to respond with the couple of queries we had. Many thanks for a lovely holiday. Guest from Pontefract stayed for 7 nights. Would stop here if we were to visiting the area again. Kids loved the pool which was warm for the time of year. Very relaxed and didn't feel other accommodation was on top of us. Guest from Knutsford stayed for 7 nights. We had a great week at Budock Cottage. Lovely size rooms for our family of four. The children enjoyed playing on the trampoline, dipping in the pool and hanging out in the games room. The kitchen was extremely clean and easy to use. Three items we missed that may seem minor but would have been really useful are: hooks on the back of the bathroom and bedroom doors, oven gloves and tea towels. The cottage is in a good location, easy to get to Falmouth and various beaches on the Lizard peninsula. Guest from Lydney stayed for 7 nights. I stayed at Budock Cottage with my wife, Son, Daughter-in-law, and Grand-daughter. We felt that not a lot of work had been done on general maintenance since the cottages opened in 2008. The decoration could do with a refresh, and there were a number of minor irritations such as broken recliners (sofa's), toilet seat that slipped around under 'impact', There were no bedside lights in the twin bedded room, which was a nuisance during the night when trying to reach the toilet without falling over or disturbing the other folks in the cottage. The main bugbear were the dogs that other people had brought along to the other cottages, and the lack of respect the owners of these dogs had for the notices in the childrens outdoor play area asking for no fouling in the field. My grand-daughter manged to stand in dog poo in the field containing the children's play area which was unpleasant to say the least. The children's outdoor play area is contained in quite a large field, which it seems to me, could be easily subdivided, and an 'absolutely no dogs' rulle applied to the half containing the childrens play area, whilst the other half could be given over to dogs and their 'exercise'. We visited in August, obviously paying 'top dollar' as it was high season, and I felt that we didn't really get value for money at Budock. The pool and hot tub were fantastic. Cottage finish and fixtures very good, but would benefit from a few more hooks for coats and towels. The cottage is in a complex with safe space for children to play and with beaches, gardens and villages nearby to visit. Guest from Bridgend stayed for 4 nights. As I have already indicated above, we were all extremely happy with the accommodation. That plus the fabulous weather during out stay gave us the break we needed. Thanks you for taking the time to review Budock. We are pleased you had an enjoyable stay and we have taken your comments on board and have passed onto Darren to add to the welcome packs. We look forward to welcoming you back again one day. The cottage was well proportioned and in good condition but the kitchen was poorly equipped, no oven gloves, no veg peeler and very few utensils in general. The oven badly needed cleaning and there was a blind needed replacing. Disappointed there was no Wi-Fi especially as reception for mobiles so poor and was advertised with mobile. Wi-Fi in games room was not working. Also the jacuzzi did not work! Thank you for talking the time to leave a review for Budock. I'm sorry the property was lacking in equipment & the oven was dirty, the cleaners have an inventory they follow so there must have been an over sight which I'm going to look into. With regards to the wi-fi it's since been bought to our attention by another person that it wasn't working. On further investigation it became apparent that the router was broken which we've since ordered another one. I can only apologise as this wasn't reported by guests until the end of half term period when most people were going home. The final issue of the Jacuzzi was one of hygiene and cleanliness. We had to drain the Jacuzzi before half term as the levels had dropped too much to have it up and running. We then refilled it and thought that was it but the automatic chlorine dispenser had stopped working. This then resulted in there being not enough time to get the levels up to a hygienic level. I can only apologise as our onsite manager got called away for a family crisis. We did put cover in his place last minute but there were obviously a few things that were out of our control. Pendeen Cottage is situated in a peaceful location a short drive from South Cornwall's beautiful beaches and the sea faring town of Falmouth. The property is located on a small development of a collection of converted barns with a shared outdoor heated pool and large gardens. St Keverne Cottage is situated in a peaceful location a short drive from South Cornwall's beautiful beaches and the sea faring town of Falmouth. The property is located on a small development of a collection of converted barns with a shared outdoor heated pool and large gardens. Up to 2 dogs are welcome at no additional charge. Karensa Cottage is situated in a peaceful location a short drive from South Cornwall's beautiful beaches and the sea faring town of Falmouth. The property is located on a small development of converted barns with a shared outdoor heated pool, jacuzzi, sauna and large gardens. Up to 2 dogs are welcome at no additional charge. Porthallow Cottage is situated in a peaceful location a short drive from South Cornwall's beautiful beaches and the sea faring town of Falmouth. The property is located on a small development of converted barns with a shared outdoor heated pool and large gardens. Up to 2 dogs are welcome at no additional charge. Helford Cottage has been built for couples with a modern and romantic design. Located on the beautiful South Cornish coast, it is situated in a peaceful location a short drive from South Cornwall's beautiful beaches and the sea faring town of Falmouth. The property is located on a small development of a collection of converted barns with a shared outdoor heated pool, jacuzzi, sauna and large gardens. Up to 2 dogs are welcome at no additional charge. Mousehole Cottage has been built for couples with a modern and romantic design. Located on the beautiful South Cornish coast, it is situated in a peaceful location a short drive from South Cornwall's beautiful beaches and the sea faring town of Falmouth. The property is located on a small development of a collection of converted barns with a shared outdoor heated pool and large gardens. Trelawny Cottage is situated in a peaceful location a short drive from South Cornwall's beautiful beaches and the seafaring town of Falmouth. The property is located on a small development of converted barns with a shared outdoor heated pool and large gardens. Up to 2 dogs are welcome at no additional charge. Newlyn Cottage is situated in a peaceful location a short drive from South Cornwall's beautiful beaches and the sea faring town of Falmouth. The property is located on a small development of a collection of converted barns with a shared outdoor heated pool and large gardens. Up to 2 dogs are welcome at no additional charge. Just a short walk from the central Falmouth harbour area with fantastic restaurants, the National Maritime Museum, Rick Stein's Fish Restaurant and less than a mile away from one of the area's most popular sandy beaches at Gyllyngvase, Number 7 offers a convenient, home from home in one of Cornwall's most famous towns. It has the benefit of private parking. Water Side has a stunning water front location with its own private dock and awesome views across Falmouth marina. There is a spacious sun deck, large barbecue and a separate dining area to make the most of the wonderful vista, you will not find a better place to enjoy a barbecue and glass of wine.